Congress has accused BJP of attempting to "destabilise" its government in Arunachal Pradesh. What is the Arunachal crisis that has the Congress and BJP at loggerheads? The winter session of the Parliament continues to be marred by disruptions. Chaos has ensued and bitter words have been exchanged over the Arunachal crisis. But what is all the outrage about? The Arunachal crisis has rocked the Parliament for a week now, causing frequent disruptions and adjournments. A delegation led by Congress supremo Sonia Gandhi met with President Pranab Mukherjee on 16 December to request his intervention in the Arunachal Pradesh Assembly. However, hours after the Congress delegation met with the President, a no confidence motion was held by members of Arunachal Assembly against Chief Minister Nabam Tuki, which he lost. Dissent within the Congress government in Arunachal Pradesh has been brewing for some time now. In October for instance, four top level officials resigned from their posts, accusing the incumbent state government of breeding corruption and nepotism. In their resignation letter, the top officials - which included Mineral Development and Trading Corporation Ltd chairman Techi Lama, Hydro Power Development Corporation Chairman Tani Loffa and Monitoring and Vigilance Committee chairman Toko Anil - accused Chief Minister Nabam Tuki of mismanaging finances and favouritism. In early November, two others resigned - trade & commerce and geology & mining parliamentary secretary Phosum Khimhun along with Arunachal Pradesh Bamboo Resource Development Agency (APBRDA) chairman Chau Zingnu Namchoom - citing lack of resources and negligence on the chief minister's part. On 12 May 2015, Jyoti Prasad Rajkhowa was appointed the governor of Arunachal Pradesh by President Pranab Mukherjee. According to a report, his relationship with the RSS top cadre weighed in his favour for appointment to the position. On 9 December, Rajkhowa sent a message to the state legislative assembly issuing terse instructions for its functioning. The Indian Express reported that the instruction mandated the termination of Nabam Rebia from the Speaker's position. It "shall be the first item on the agenda of the House," the instruction read. While the governor's message said that the Deputy Speaker should be presiding over the Assembly's proceedings from the first sitting, some of the Congress MLAs from the state had allegedly given a notice in November for his removal for anti-party conduct. Soon after, BJP MLAs from the Opposition asked for removal of the Speaker. The Assembly's winter session was initially scheduled for 14 January but was rescheduled to 16 January by Rajkhowa. 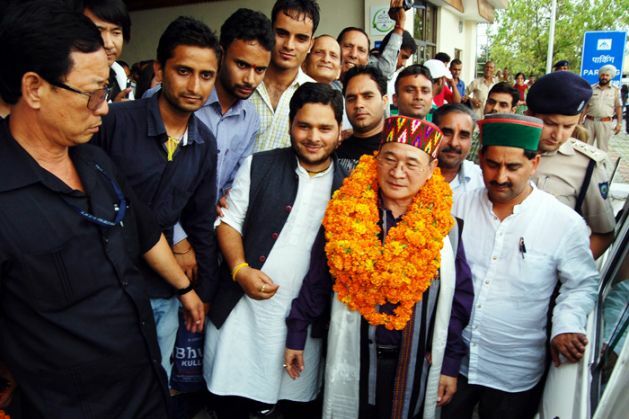 However, on the first day of the Assembly in Itanagar, chaos ensued when supporters of Nabam Tuki blocked the entrance, prompting the Speaker to seal the Assembly premises. The dissenting MPs - 11 BJP MLAs, 2 Independents, and 21 Congress dissidents, including Deputy Speaker T N Thongdok - met elsewhere and passed an impeachment motion on Wednesday against Speaker Nabam Rebia. The Parliament faced disruptions as well. The Sonia Gandhi-led delegation met with the President over the issue. They accused the BJP of conspiring to "destabilise" the elected government in Arunachal Pradesh and urged Mukherjee to issue "appropriate directions" to uphold the sanctity of the Constitution. "It is clear that the BJP top leadership in connivance with some dissident Congress MLAs planned to destabilise the democratically elected government in Arunachal. This is obviously a pre-planned design involving the highest functionaries of the central government." A few hours after the delegation met Mukherjee, an unprecedented even took place in Arunachal Pradesh. 33 of the 60 members of the Arunachal Legislative Assembly met at a community hall in Naharlagun and passed a no confidence motion against Chief Minister Nabam Tuki through signatures and voice vote. Further, they chose a "rebel" Congress leader Kalikho Pul as the new chief minister. The session was chaired by Deputy Speaker T Norbu Thongdok. Tuki and 26 other Congress MPs boycotted this "makeshift" Assembly citing them as "illegal and unconstitutional". Acknowledging Pul as the "new Leader of the House", Thongdok added that a record of the "proceedings" would be received by the governor who would issue further instructions regarding the swearing of the new chief minister and his council soon. Nabam tuki has now written to the Prime Minister and President, calling the move a "murder of democracy and bypass of a democratically elected government". TWEET THIS Congress has accused BJP of attempting to "destabilise" its government in Arunachal Pradesh. What is the Arunachal crisis that has the Congress and BJP at loggerheads?